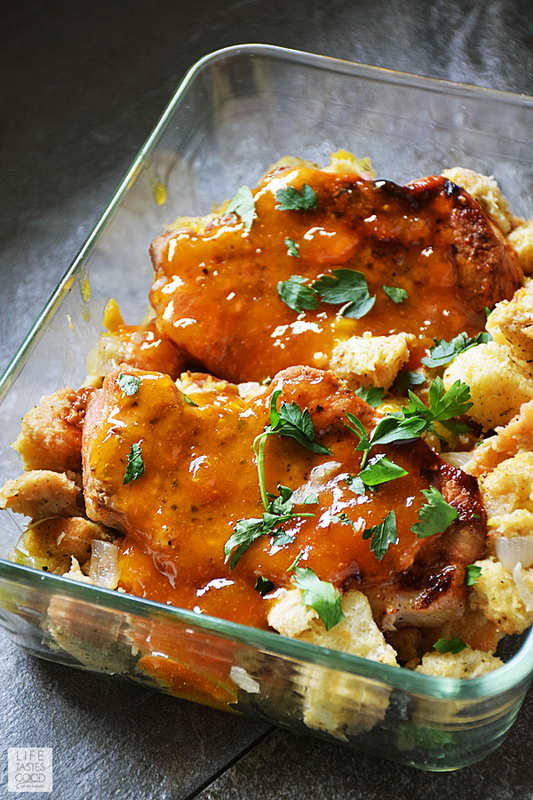 Peach Glazed Pork Chops and Stuffing is an easy meal you can enjoy any night of the week! 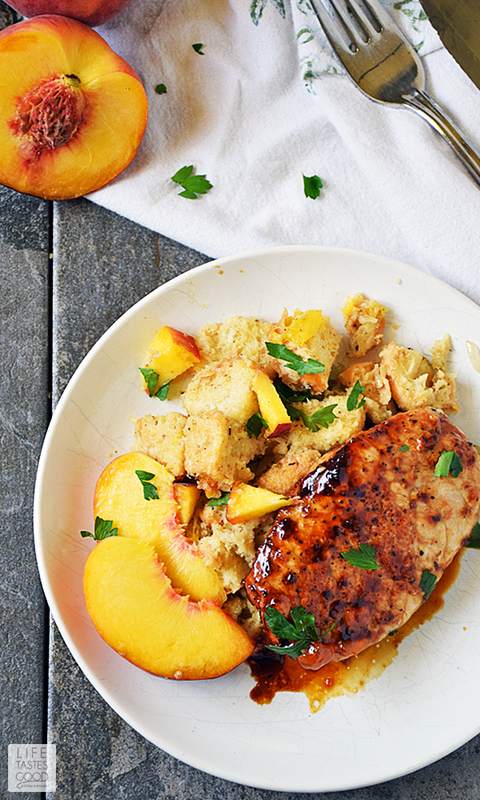 This easy recipe pairs sweet, fresh peaches with savory homemade stuffing and pork for an exciting flavor combo the whole family will love. Even more exciting is having a delicious dinner made with fresh ingredients on the table in about 30 minutes! I'm feeling just peachy this week. Why, you ask? Because it is prime time for peach season, and I couldn't resist cooking up this tasty recipe using our favorite stone fruit. I love this recipe because it is so easy to make and has a nice balance of sweet and savory flavors that everyone seems to love. The fresh peaches are a nice touch, but if peaches aren't in season you can sub in frozen or canned if you must. I also recommend making fresh stuffing for this recipe as it doesn't take a whole lot of time and is leaps and bounds above the boxed stuff as far as taste and nutrition. For the stuffing, I had a pretty good sized baguette that needed to be used up, so I put it to work in this recipe. You can use pretty much any kind of bread you like to make a yummy stuffing by slicing the bread into cubes, toasting it and then mixing it with some sauteed onions and celery. Toss in some seasoning such as sage and thyme and pour on chicken broth to moisten. It really is that easy. I make this all in one skillet by first making the stuffing and then reusing the skillet to quickly pan sear the pork chops. Boneless pork loin chops only take about 3-4 minutes per side to cook through. While the chops are searing, I mix the 2 ingredient glaze and heat it in the microwave and then brush it on the pork. I reserve some to serve with the meal, because you can't have too much peach glaze. That is the truth! 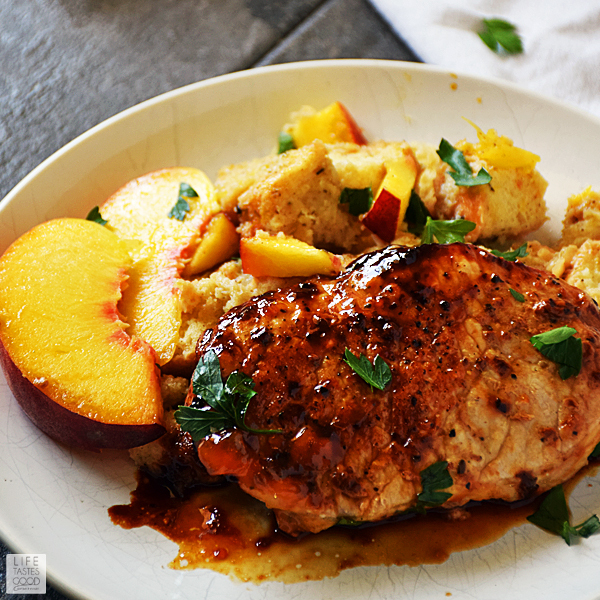 Peach Glazed Pork Chops and Stuffing is an easy meal you can enjoy any night of the week! 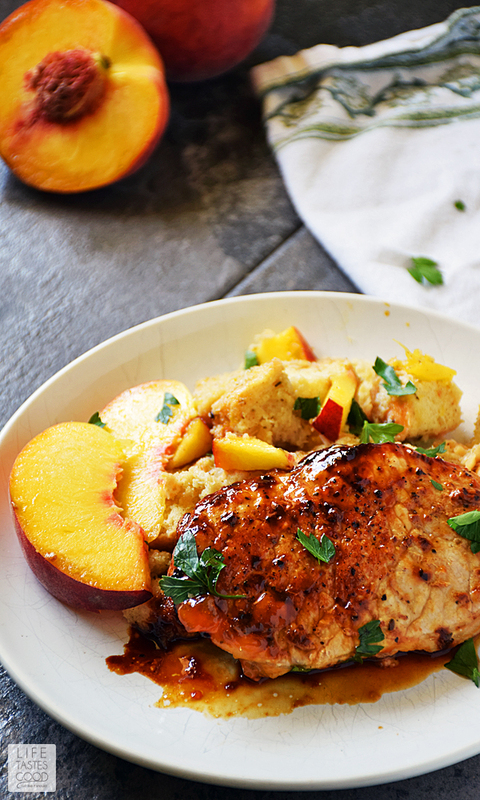 This easy recipe pairs sweet, fresh peaches with savory homemade stuffing and pork for an exciting flavor combo the whole family will love. Preheat oven to 350°F. Line a baking sheet with foil and spread the bread cubes out in a single layer on the baking sheet. Bake in the preheated oven until evenly toasted, about 5-7 minutes. Transfer to a large, heat-proof bowl and set aside. In a skillet over mid-high heat, melt 1 tablespoon of butter. Saute 1 cup diced onion with 3/4 cup diced celery and a diced peach until the vegetables soften. About 5 minutes. Season with 2.5 teaspoons dried sage and 1/2 teaspoon dried thyme. Stir to incorporate and add 1 cup water with 1/2 tablespoon of chicken base. Stir to combine and give it a taste. Add salt & pepper as needed. NOTE: You can also use 1 cup of chicken broth if you prefer. Pour the chicken broth mixture over the toasted bread and stir to coat. If the bread is too dry, add more chicken broth to your desired consistency. Season pork chops with salt and pepper on both sides. In the same skillet over mid-high heat, melt 1 tablespoon butter and place pork chops in the skillet. Sear for 3 minutes and flip over. Brush with peach glaze (see next step to make peach glaze while chops are searing) and sear for 3 more minutes. Flip again and brush other side with peach glaze. Check internal temperature for doneness. Pork chops are done when an instant-read thermometer inserted in thickest part of chop registers 140°F. Allow to rest for 5 minutes. While the pork chops are searing, combine 1/3 cup peach or apricot preserves with 1/2 tablespoon Dijon mustard in a microwave safe dish (I use a measuring cup). Heat in the microwave for 30 seconds to a minute until the preserves are melted. Divide this mixture in half and use one half for basting while the chops are cooking and reserve the other half to serve with the chops. Serve the pork with the stuffing and reserved peach glaze. Garnish with freshly chopped parsley and fresh peaches. Enjoy! What a gorgeous meal! We eat a lot of chops and now I'll be dreaming of yours!!! What a fabulous combination of flavors. This looks wonderful! I love the glaze and stuffing! I love homemade stuffing especially with pork. This recipe is a keeper!